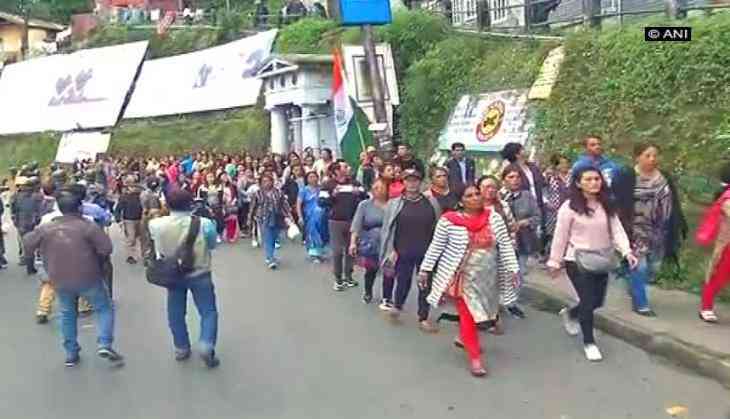 A day after violence returned to the Darjeeling hills, Gorkha Janmukti Morcha supporters set ablaze an office of the Gorkhaland Territorial Administration (GTA) on day 14 of the indefinite shutdown on Wednesday. The office of the GTA's engineering division was torched last night. Protesters also ransacked a panchayat office in Bijanbari area, 25 km from Darjeeling. The police and security forces were patrolling the streets and keeping a tight vigil on all entry and exit routes. Barring pharmacies, all shops, schools, colleges were closed and Internet services remained suspended. The Gorkha Janmukti Morcha has plans to take out rallies and burn copies of the GTA accord on Wednesday. The GTA agreement was signed by the Centre, the state government and the GJM in 2011 following a prolonged unrest in the hills. The GJM asserted that its 45 members had resigned from the GTA last week and the administrative body had ceased to exist. Hundreds of GJM activists held a demonstration in Darjeeling on Tuesday and burnt copies of the GTA accord. Some shirtless GJM workers during the demonstration smashed tubelights on their back leading to injuries. Activists of the Yuva Morcha, the youth wing of the GJM, had threatened to commit self-immolation and launch a fast unto death if the Centre did not pay heed to their demand for a separate state. GJM activists and pro-Gorkhaland supporters had also set fire to the house of the chairman of a development board in Kalimpong district on Monday night.